In section 1, we discussed the incidence of a deep bite in growing children and its implications on the development and health of a child. 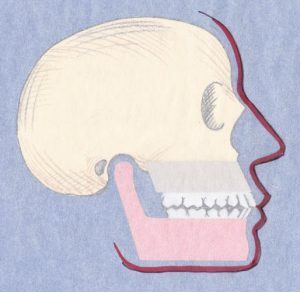 A deep bite relates to the vertical length of the back part of the mandible (lower jaw), which also contains the growth (proliferation) zone for the proper development of the jaw. Functional jaw orthopedics allows this growth zone to be influenced. With functional appliances: in children who have many jaw problems at the same time, such as a small jaw, crowding, a deep bite, etc. 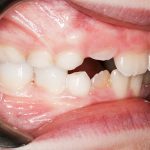 Without appliances: In children aged 5-8 with a deep bite, and in the event that there is no significant arch size crowding, or no retruded lower jaw, a very simple method of bite opening can be implemented without the use of appliances. It is also considered a form of interceptive jaw orthopedics, mainly because it repositions the jaw, and therefore causes an acceleration in the growth of the proliferation zones of the jawbone. It involves adding material to the lower baby (or primary) molars. This will increase their height and allow the jaw to close at a vertically open position. 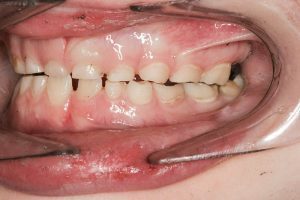 This is achieved directly, by creating a jig to determine the amount of vertical opening, and adding composite on the lower primary teeth. Another material which can be used is a ceramic polymer overlay on the same primary molars. In the past, impressions were taken of the jaws. 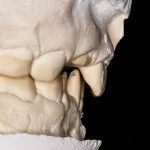 Today, we do this by digitally scanning the jaws with a wand, (for example, a CEREC procedure) and milling four overlays out of a more durable and biocompatible material. Parents who are concerned about “plastics” and “BPA-like” materials, this is the way to go. It is costlier, but a sound option. 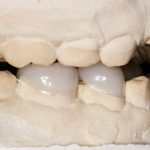 After the overlays are bonded, permanent teeth that erupt will grow to the newly established vertical dimension. 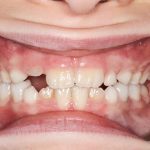 By the time the teeth with the overlays are shed (ages 10-12), the functional effect will already be achieved with permanent desired changes to the jawbone. This case exhibits a deep bite which initially will need only a direct bite opening with overlays. Computer (or lab-made) overlays are placed on the model to demonstrate the amount of vertical gain. This case also exhibits a deep bite which initially will need only a direct bite opening with overlays. 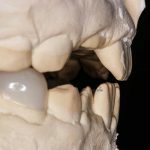 This angle demonstrates how much the incisors separate with the overlays in, creating room not only for the teeth to erupt higher, but also for the tongue. The same case in real-life after bonding the overlays (side). The same case in real-life after bonding the overlays (front). Q: WHAT ARE THE CONSEQUENCES IN ADULTHOOD IF THIS IS NOT ADDRESSED DURING CHILDHOOD? A: Many teens and adults develop crowding, which by many orthodontists is resolved by extracting four healthy bicuspid teeth to make “room”. 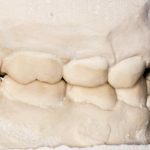 This spells even more trouble as they hit middle age, since these adults develop Jaw-joint problems, have a flat face with no lip support, and their risk for sleep apnea is increased manifold. …and one with a retruded lower jaw. Q: DOES MY CHILD AVOID BRACES IN THE FUTURE IF THIS EARLY INTERVENTION IS CARRIED OUT? A:. Not necessarily, because there are other factors at play for needing braces. However, if needed, the time needed will be reduced significantly, and the end outcome will be much nicer. 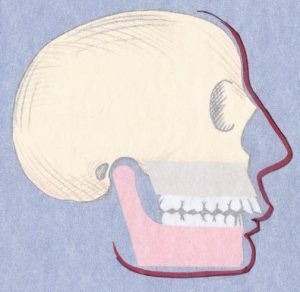 At this early stage we are concerned with the foundation of the jawbone, in three dimensions: vertical, lateral (sideways) and sagittal (forward). This entry was posted in Bite Opening, Jaw Orthopedics by Admin. Bookmark the permalink.